Chuck Liddell, throughout his career has made a solid living on stalking his prey, cutting off angles, an throwing big power shots to dismantle his opponents in the cage. Unfortunately for him, he’s never expanded his skills beyond that. In the new world of MMA, game plans are just as important as a fighter’s abilities and Liddell has become one of the easiest guys to prepare against. Rich Franklin is a smart enough not to get in heated exchanges with the “Iceman” in risk of taking an early nap. I like Franklin to use his leg kicks to keep his distance from Liddell, while using his effective clinch game to score points when Chuck does get inside. I do expect Liddell to land a couple large overhand rights in the fight just to keep things interesting, but Rich will survive and earn himself the unanimous decision victory. On Saturday night, no matter what, one of the most beloved fighters in UFC/MMA history will be one step closer to retirement. 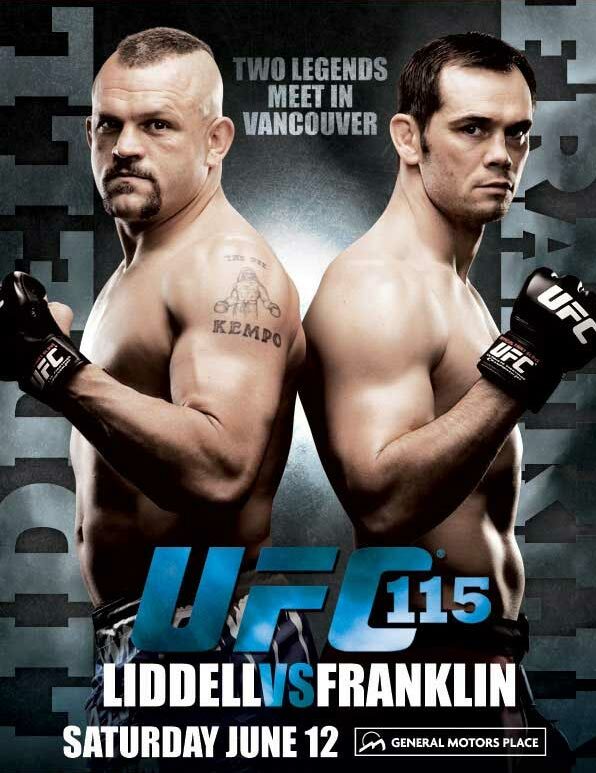 Chuck Liddell and Rich Franklin are both in a “must win” situation to keep any title contender relevance at all. At UFC 115, whoever doesn’t get their hand raised at the end of the night will be stuck at a gatekeeper/gimmick match role for the rest of their career. The once feared Croatian striker “Cro Cop” meets another highly talented, upcoming heavyweight in Pat Barry at UFC 115. On paper, Barry is the heavy favorite in this fight. He has the hand speed to frustrate Mirko, and the power behind those punches to end the night early. Barry also has incredibly powerful leg kicks that could turn the worn down stems of Filipovic into an applesauce like substance. With all of that said, there is still a part of me that thinks Cro Cop wins this fight. Pat Barry’s gas tank is a serious question mark. As Barry wears down, his hands will drop, leaving him open for a left high kick from Cro Cop that can shut out the lights on anyone. Just 2 weeks after Mike Russow de-railed the Todd Duffee hype train, don’t be surprised if Pat Barry is the next to falter. Former WEC welterweight champion, Carlos Condit takes on the young Canadian phenom Rory MacDonald. On the feet, Condit has the more effective striking and clinch game to fluster MacDonald. The problem is, Condit’s Achilles heel has always been his take-down defense. MacDonald will have no problem getting this fight to the floor, where he will have complete control. Condit has a good guard game, but MacDonald will not be looking to stay in that guard for very long. With his slick jiu-jitsu, MacDonald should have no problem moving to better positioning on Condit keeping him out of trouble. Condit is a very tough guy to finish, but the constant ground and pound matched with multiple submission attempts should earn Rory MacDonald the easy decision. Paulo Thiago has shown he can dominate fights anywhere the action may go. He’s got crisp boxing, with power behind the punches on the feet, a paralyzing top-control game, and savvy jiu-jitsu to lock up submissions from any position. Kampmann is also incredibly well-rounded, but is not better at any one skill than Thiago. Kampmann may try for takedowns of his own, but Thiago showed against Jacob Volkmann that he’s very good at creating scrambles and taking back control from those take-down attempts. Not much to break down in this fight…. two large heavyweights that like to throw big hands. Yvel will look to keep distance while looking for the one big powerful punch or kick for the knockout. Rothwell wants to get in close and maul his opponent with a lot of short punches in route to a TKO stoppage. The loser will most likely be given their walking papers from the UFC. Two Xtreme Couture fighters showing the rest of the world that teammates can compete against each other… take heed AKA camp. Both fighters are stylistically similar just with different body types. Dunham, the much taller fighter will have the sizable reach advantage and if used correctly could be the difference in the fight. If Dunham uses his jab early and often, he can keep distance with Griffin and keep this fight on the feet. Griffin likes to set up punishing combinations inside with leg kicks that slow his opponent down. If Griffin is losing the stand up war, he should have no problem dragging Dunham to the ground if he gets a hold of one of his legs. When the fighters hits the mat, the duel remains a struggle for both combatants. Dunham has a very active guard game, while Griffin’s submission defense is top notch. If Dunham ends up with top control, the outcome remains the same. I like this fight to be 15 minutes of non-stop action, with neither fighter getting a true advantage. In the end, I think Griffin’s takedowns will be key factor in the fight, even though nothing will come of them. Look for a possible split decision in this one. Mac Danzig needs a win on Saturday night or he might become the first winner of the Ultimate Fighter television show to receive his UFC pink slip. Since winning season 6 of the show, Danzig has gone just 2-3 inside the octagon. Danzig has struggled against strong wrestlers in his tenure in the UFC. While Matt Wiman’s wrestling isn’t considered to be great, it’s still better than what Danzig has to offer. Danzig’s best chance at success will be on the feet against Wiman. He can strike with efficiency at any range, but is best in close when he can deliver his powerful uppercuts. The problem with that against Wiman though, the closer he gets the more susceptible to the take-down he becomes. Wiman won’t have an easy time passing Danzig’s guard to gain better positioning, but he does have a knack for taking his opponents back on scrambles. I like Wiman to come out and test the waters on the feet early, where likely Danzig will get the better of the exchanges. Then Wiman will fall back on his wrestling/jiu-jitsu to wear down and frustrate Danzig for 15 minutes. You can’t say the UFC doesn’t do anything nice for their former superstars. David Loiseau gets another shot at UFC fame in front of his countrymen in Vancouver. Unfortunately for Loiseau, they paired him up against a rising star in Mario Miranda. Much like UFC 115’s headliner, Chuck Liddell, Loiseau is as one-dimensional as it gets. Loiseau will look to stand and bang like usual, but Miranda’s striking is good enough (if not better) to neutralize any advantage Loiseau might have had on the feet. Miranda is also the far superior grappler, so once the fight hits the ground, expect Loiseau to take even more of a beating down there. Loiseau is known for the amount of punishment he can withstand, but I feel Miranda will come out with something to prove after his TKO loss to Gerald Harris in his UFC debut. On Saturday, it will be the first time in 364 days that Peter Sobotta has stepped in a cage. That doesn’t bode well for anyone, let alone someone that’s still growing in the sport in the first place. James Wilks comes in battle tested after a three round war against the extremely tough, Matt Brown. Wilks is known for his jiu-jitsu savvy, but often fights like he’s in a grappling match and not an MMA fight, leaving his face exposed for a beat down. I don’t think that will hinder him much at UFC 115, because I don’t see Sobotta ever getting a strong top position. Once the bell rings, I see Wilks pushing the fight towards the cage, then dragging Sobotta to the ground. Once the fight hits the floor, it shouldn’t be too long until the submission stoppage occurs. Jesse Lennox is at his best, wrestling his opponent to the ground then posturing up and dropping hammer-fists. He might have to come up with a new game plan on Saturday if he hopes to leave Vancouver with a victory. With 16 submission victories, Mike Pyle is one the most accomplished grapplers in the division. Neither Pyle or Lennox are strong boxers, but Pyle is known for going into panic mode after the first time he gets hit hard. Jesse Lennox doesn’t have the takedown defense to keep this fighting standing for very long though. Another top Canadian welterweight prospect, Claude Patrick makes his debut on home turf at UFC 115. Ricardo Funch showed little offensive dexterity in his fight with Johny Hendricks, but did show a toughness you can’t teach. Funch was easily taken down by the Oklahoma State wrestling phenom, but was able to will himself out of tough situations. Claude Patrick will have the same take down efficiency as Hendricks, but his ability to finish the fight is much greater. This should be an easy showcase fight for Claude Patrick. UFC UFN 20: Who or What’s Next? Gray Maynard – Well, it won’t be BJ Penn. Maynard didn’t do nearly enough to leap frog Frank Edgar for the title shot. I think a fight between Kenny Florian or teammate Tyson Griffin would be the right contenders to see who would get the next shot at the title after Edgar. Nate Diaz – Diaz is in a tough position, as he has lost 3 out of his last 4 fights. He shouldn’t get fights against guys at the top of the division any more for a little bit. He might just be a gate-keeper from here on out in the division. I think a fight with a guy still in the top 20 is still in order to see if he can hang with the big guys anymore. Terry Etim, Kurt Pellgrino, or Joe Lauzon would be good measuring sticks. Evan Dunham – The UFC has a tendency to throw their up and coming prospects straight into the lion’s den after a big win. I hope that is not the case with Dunham. There are still a lot of tough match-up in the middle of the division that i believe would be the right next step. 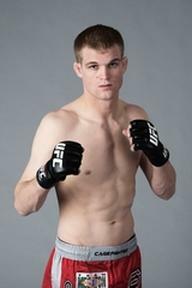 Cole Miller, Matt Wiman, or Dennis Siver would be a great possible next step for the young fighter. Efrain Escudero – Hopefully Escudero’s arm isn’t injured, and he’ll be able to return soon. When he does, i see another mid-level fighter for the former TUF winner. Rafael dos Anjos, Paul Kelly, or Caol Uno to name a few. Aaron Simpson – I think it’s time for Aaron Simpson to get a big jump in competition. I’d like to see him go up against somebody like Tim Creduer, Patrick Cote, or Kendall Grove. Tom Lawlor – Lawlor came out swinging early, but really slowed down after the first. Time to see where Lawlor really stands…. UFN 20 Winners, Nick Catone or Gerald Harris would be a nice test. Amir Sadollah – There are so many good fights at 170 for Amir Sadollah. He’s shown great improvement against Phil Baroni and Brad Blackburn, but i don’t think he’s quite ready for the top half of the division. I think he needs to take on a grappler to see where his ground game is at. TJ Grant, Dennis Hallman, or Rob Kimmons would definitely try and get the fight to the ground. Brad Blackburn – Blackburn had a nice run to start his UFC career, but just didn’t look good in the Sadollah fight. Blackburn now, will probably get an up and coming welterweight ready to take his game to the next level. John Hathaway, Johny Hendricks, or Mike Pierce is looking to take that next step. Chris Leben – What a win for Leben. I really thought i would be talking about how we might have seen his last fight in the UFC. But instead, he showed an improved ground control game which makes him a relevant fighter again. Do you give him another fight where you know the other guy will trade, or do you test him with a grappler? Right off the top of my head, Mark Munoz sounds like it would be an exciting match-up that could even put him back on a main card. Jay Silva – I just don’t see Jay Silva having a job in the UFC after starting 0-2. Rick Story – I think Rick Story has seen his name on the prelim card for the last night. Every fight this guy has had in the UFC has been back and forth nail biters. After back-to-back wins, Story should start seeing some bigger named fighters across from him. I think a fight with Amir Sadollah, Rory Markham, or Johny Hendricks would be another awesome fight to get his name out there to the casual fan. Jesse Lennox – A fight with another guy with only one victory is probably next for Lennox. DaMarques Johnson, Rory MacDonald, or Mike Pyle fit that bill. Nik Lentz – Lentz will probably be fighting for his UFC career in his next fight. I bet he will be matched up with somebody who has the same fate. Aaron Riley, Fabricio Camoes, or John Gunderson would be a possible choice. Thiago Tavares – Tavares also needs a win in his next fight, or his UFC job may be in jeopardy. Tavares will still likely get a tougher match-up in his next fight, due to his experience in the UFC. I could see Rafael dos Anjos, Dennis Siver, or Matt Wiman as possible choices. Rory MacDonald – MacDonald has the skills to be something great. He is also another guy I’d like to see be brought up slowly. Matt Riddle, Jesse Lennox, or Paul Taylor would be a nice next step. Mike Guymon – Guymon may have lost his debut against a phenom, but he still has a lot to offer the UFC. A fight against a guy competing for his job is probably in place for Guymon next. Jacob Volkmann, Ricardo Funch, and Phil Baroni fit that mold. Rafael dos Anjos – Dos Anjos got the win he needed, now he must take his game to the next level. Paul Kelly, Ross Pearson, or Thiago Tavares should be the next test. Kyle Bradley – Back to the local circuit for Bradley. John Salter – Most likely will get another shot. Steve Steinbiess, Jesse Forbes, and Mike Massenzio would be likely survival fights. Nick Catone – Catone is another UFN 20 winner who saved his job with the win. Catone will probably still be on thin ice his next fight, as he needs to continue proving he belongs in the crazy middleweight division. Wilson Gouveia, Gerald Harris, or Tom Lawlor are in the same boat. Jesse Forbes – Forbes will most likely get another shot, due to his fight with Catone being exciting and close. He will most definately be fighting for his job next fight as well. John Salter, Steve Steinbiess, or Mike Massenzio is most likely the choice. Posted by Matt Faler on January 12, 2010 in UFC, What or Who's Next? A very unusual game plan for Gray Maynard cost him a title shot against BJ Penn, and nearly cost him the fight. Diaz has struggled heavily against strong wrestlers in his last few fights, yet Maynard chose to stay on the feet the entire time. Not only did Maynard choose to keep it standing, but even got caught up in Diaz’s trash talk during the bout. In my opinion Nate Diaz did just enough to eek out the first round and he clearly won the third. The 1st round was close enough that it wasn’t a shocker that Maynard’s hand was raised at the end, but he should feel incredibly lucky. I have to feel Randy Couture and Gray Maynard had a better game plan coming in, but that all went out the window when he saw Diaz across the cage. Gray Maynard leaves tonight the victor… but the true winner of the night is Frank Edgar. He should send Maynard a thank you card. The world was introduced to a future star in this sport tonight. Evan Dunham showed to the world tonight that he is as dangerous as anyone in the division. Dunham weathered an early assault in the first round, showing his durability and recovery speed. Second round he showed his solid striking and controlling wrestling. And finally in the 3rd, Dunham showed he is even deadly off his back after his slick triangle choke that transitioned into an armbar. Escudero and Dunham both have long careers ahead of them in the UFC, and I’m excited to watch their continued growth. I take my hats off to both of these warriors. Tom Lawlor came out in the first round like a bat out of hell. We all knew Aaron Simpson has dynamite in his hands, but after tonight we were shown he also has a granite chin. Lawlor looked like he could finish the fight at any time after landing multiple big strikes and knees. Simpson was dazed, but never stopped defending himself. The second round was more even as Lawlor began to tire and Simpson was able to utilize his wrestling more. Lawlor i felt still was getting the better of the exchanges on the feet, and never really took much damage when on the ground. Third round, Lawlor was gassed out and was just looking to not get caught in a choke or a big right hand. Aaron Simpson ended up getting the split decision victory, but both fighters should leave with their head high. A lot of heart was shown by both men. Amir Sadollah’s stand up was very impressive tonight. He had Blackburn just baffled in the 2nd and 3rd rounds with his arsenal of strikes and kicks. Amir really has improved since his days on The Ultimate Fighter. Blackburn looked a lot slower and more hesitant than usual. I wonder if he had trouble cutting weight for this fight… something just seemed off. The shocker of the night…. not because Leben won, but how he won. Leben beat Silva not just with his hands but a solid ground game as well. Leben was able to take Silva down almost at will, then was able to move to better positioning, including getting mount a couple times. On the other side, a very disappointing UFC career for Jay Silva. He had a lot of hype coming in, but losses to CB Dollaway and Chris Leben will probably have him back in the local circuit. To most on-lookers, Rick Story should have had an easy unanimous decision victory over Jesse Lennox. Instead, he’ll have to settle for the split decision victory. The fighters kept a frantic pace to the fight, which continually moved from stand up to grappling and back to the feet. Story was the more effective fighter, and badly bloodied and bruised the face of Lennox. Nik Lentz used his fast paced strategy combined with solid wrestling to earn him the first round of the fight. But the battle tested Tavares, came back with crisp striking to win the second and third rounds. Unfortunately, he was deducted a point in the 3rd round for an illegal kick to the groin. A majority draw was the decision, which has to be incredibly disappointing for Tavares, who really needed a win after being away from the cage for so long. The young Canadian superstar impressed all in his first fight in the UFC. MacDonald was rocked early from a right hand from Guymon, but instincts kicked in and he got the takedown. From there, he worked himself into the crucifix position and then focused on one arm, securing an arm bar for the win. Rory MacDonald gets a big win against a veteran of the fighting game, and proves to everyone that he is the real deal. Watching this guy grow as a fighter will be a treat. Just as expected, Dos Anjos had a pretty easy night as he completely out classed Kyle Bradley. It’s hard to believe that Kyle Bradley will have a job in the UFC after his 1-3 start in the octagon. Harris wasn’t as flashy as expected, but he came alive in the 3rd round to earn a TKO victory over the inexperienced Salter. Jesse Forbes stuffed a lot of the take down attempts from Nick Catone in the first two rounds, but was worn out by third. Catone used those take downs and solid ground control to earn himself the split decision victory. A big win for Catone, as it probably kept him employed by the UFC.